The Unicode Technical Committee is soliciting feedback on pending additions to the draft repertoire of characters, to help discover any errors in character names, incorrect glyphs, or other problems. There is a short window of opportunity to review and comment on the repertoire additions noted below. Additional repertoire for two amendments to ISO/IEC 10646:2017 (5th Edition) is under review. See the associated repertoire in: Feedback on draft additional repertoire for Amendment 1.3 (PDAM) to ISO/IEC 10646:2017 (5th edition) and Feedback on draft additional repertoire for Amendment 2 (PDAM) to ISO/IEC 10646:2017 (5th edition). Review of the Amendment 1.3 draft repertoire is especially urgent, as that content will be finalized by SC2 in September, and is scheduled for eventual publication in next year's Unicode 11.0. Note that the hentaigana and emoji portions of the amendment have already been accelerated for imminent publication in Unicode 10.0, so further comments on character names for those portions of the repertoire are no longer actionable. There is more time to provide feedback on the Amendment 2 draft repertoire, but note that the addition of Mtavruli Georgian as part of that repertoire is also rather urgent. 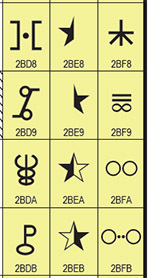 The Unicode Standard is developed in synchrony with ISO/IEC 10646. After ISO balloting is completed on any repertoire additions, no further changes or corrections will be possible. (See the FAQ Standards Developing Organizations for additional information on the stages in ISO standards development.) Advance feedback on these repertoire additions will help inform the UTC discussions about its own contribution to the ISO balloting process. Documents referenced in the draft repertoire with numbers such as L2/15-088 are available in the UTC Document Registry. For information about how to discuss this Public Review Issue and how to supply formal feedback, please see the feedback and discussion instructions.